As you read this post I am in San Diego...joyous to see my youngest son graduate today from Marine Corp Boot Camp and joyous to see my parents, whom I've not seen in a couple of years! 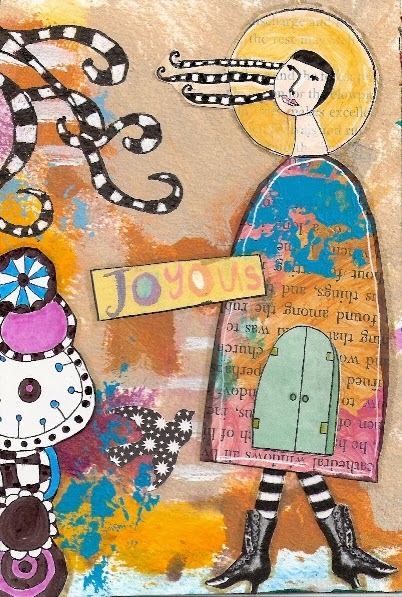 I created this 4x6 joyous mixed-media collage to use in my Documented Life Planner this week. It features several Roc Nicholas Rubber Stamps: Steampunk Border, Squiggly Arms, (altered) Little Church, and (altered) Roc's Angel. One of the many things I love about Roc Nicholas Rubber Stamps is that they're able to stand alone, and they're also able to be cut apart and fit together in a whole new way. 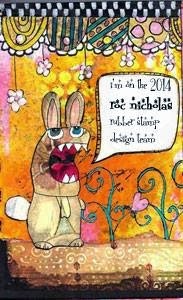 To see some other creations using Roc Nicholas Rubber Stamps, visit Roc's blog. Great collage Cathy, love how you altered Roc's stamps !